The Remix 2014 event was a huge success not only on the night (the venue hit full capacity and we had to stop letting people in) but also on social media and the blogosphere in the following days. The Remix 2014 Gold Prize was awarded to Japanese entrant Shohei Ohashi, who not only took home a cash prize, but also an invitation to intern at Aquilano Rimondi. 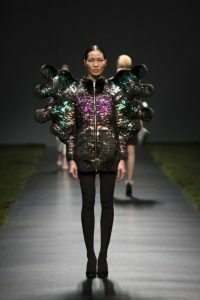 Shohei’s garment included mink, white finn raccoon and goat fur, which was dyed and plucked to reach the desired effect. 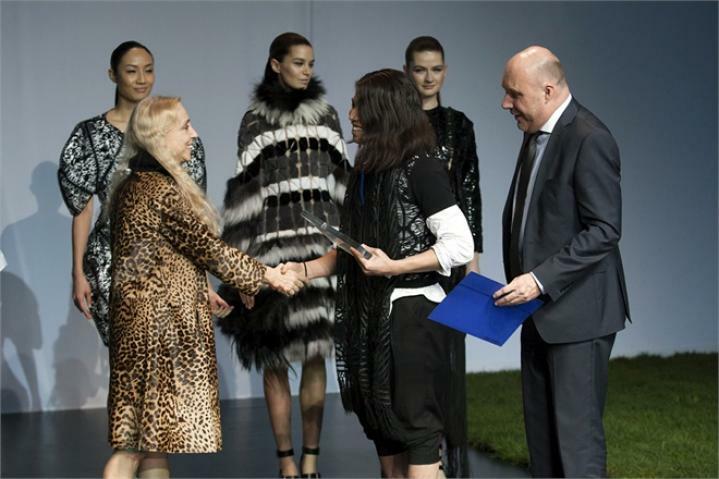 UK entrant Altynai Osmoeva won the Remix 2014 Silver Prize, with her black mink, felt and emulsion garment. The mink was delicately screen printed with pink paint to give a watercolour effect. Altynai, originally from Kyrgyzstan, has a special love for traditions and different cultures and draws inspiration from traditional crafts around the world. Her aim in fashion is to make comfortable, yet avant-garde pieces of clothing that reflect tradition, craftsmanship and originality. The Bronze Prize went to Mijia Zhang from the USA, who presented a mink garment that used airgallon and intarsia techniques. Mijia is studying Fashion Design at Parsons in New York City, and is interested in the high tech aspects of robots and incorporating this aspect into textiles. Mijia likes to create clothes with a sense of humour. Finally, the Pimp my Coat Award went to Nikoline Liv Andersen from Denmark, who worked with Saga Furs on her creation. They decided to use a very traditional and conservative mink coat, but give it an edgy look with an untraditional shape and foil.